On the morning of November 11th, it was informed by the Vietnamese delegation at the International Olympiad on Astronomy and Astrophysics (IOAA) in China that the delegation itself had successfully acquired 4 medals. Specifically, Tran Xuan Tung from class 12 Physics 1 of Hanoi - Amsterdam High School for the Gifted won a Gold Medal, Ho Phi Dung from class 11 Physics 1 of Hanoi - Amsterdam High School for the Gifted won a Silver Medal , Le Tran Dao and Nguyen To Vinh Huy from class 12 Physics 1 of Hanoi - Amsterdam High School for the Gifted both won a Bronze Medal. For the first time, the VIetnamese delegation has succeeded in winning a gold medal at the IOAA. The International Olympiad on Astronomy and Astrophysics (IOAA) 2018 welcomed 38 countries with 46 teams, involving 37 countries with contestants and the Republic of Mali as observers. 313 participants of IOAA this year consisted of 71 teachers, 214 students and 28 observers. 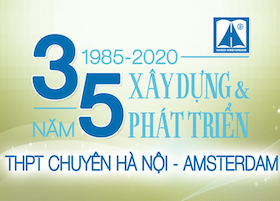 This is the third time Vietnam has participated in IOAA. Contestants at IOAA are obliged to take four tests: Test of Experiments (including 3 parts: Constellation observation, Constellation Mapping and Night observation from telescopes), Test of Theory, Test of Statistic Analysis and Team Test. All the tests are conducted in English. From past experiences at IOAA, as well as the thorough evaluation of Hanoi - Amsterdam’s Astrology and Astrophysics Club, the Department of Education and Training in Hanoi had organized an intensive examination in order to form the final delegation consisting of 5 students: Tran Xuan Tung, Le Tran Dao, Nguyen To Vinh Huy, Nguyen Thanh Bao from class 12 Physics 1 and Ho Phi Dung from class 11 Physics 1 of Hanoi - Amsterdam High School for the Gifted. Careful preparation was thoroughly carried out according to guidelines from the IOAA organizers, as well as the help and lectures of many experts - The Professors and Doctors majoring in Astronomy and Astrophysics from the Institute of Astrophysics at Vietnam National University in Hanoi and Hanoi’s National University of Education. Furthermore, with the effort of the Head of Delegation, teachers and students, hundreds of precise transcripts had been exchanged back and forth, enlightening the five talented students on their way to success. All of such efforts had boiled down to the outstanding achievements of 1 Gold Medal, 1 Silver Medal and 2 Bronze Medals. The achievements of the Vietnamese delegation at the 12th IOAA have once again contributed to the records of Vietnam at International Olympiads; has marked a development in the field of Astronomy and Astrophysics in Vietnam. Such achievements have also ignited the love and passion for researching and exploring in the field of Astrophysics and Astronomy, creating a springboard for the future delegations of Vietnam for future participation at IOAA.